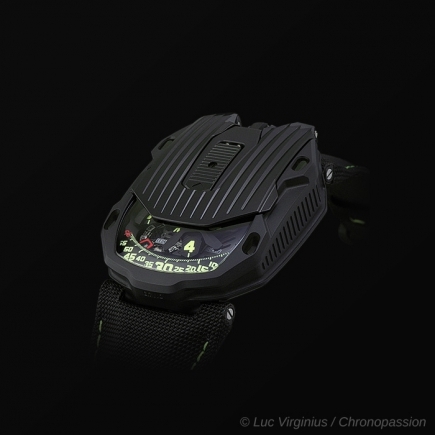 urwerk | 75'000 € Tax inc.
Can we still consider the Urwerk UR 105 Maverick as a watch? The famous watch brand that reinvented the concept of telling time through satellites is once again back on stage with a limited edition watch that will delight the most demanding watch collectors. 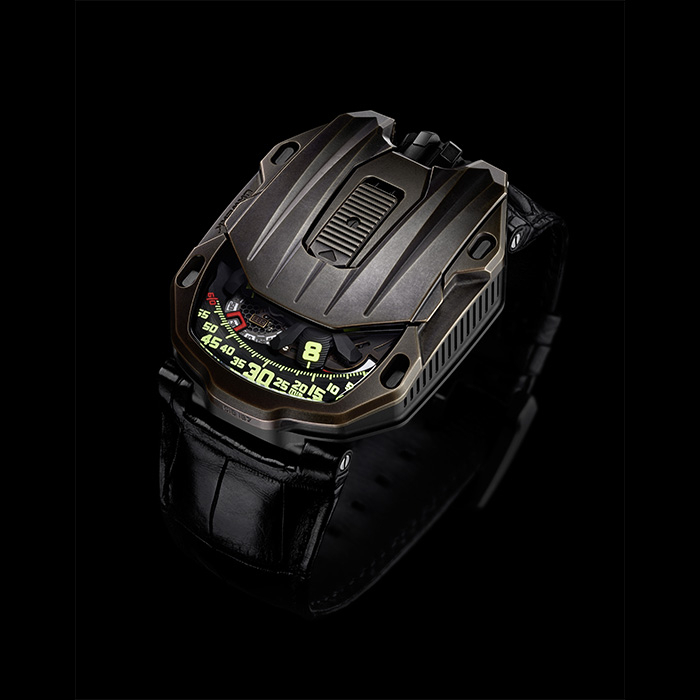 The famous Urwerk satellite mechanism of the movement is this time housed in a stunning bronze and titanium case. 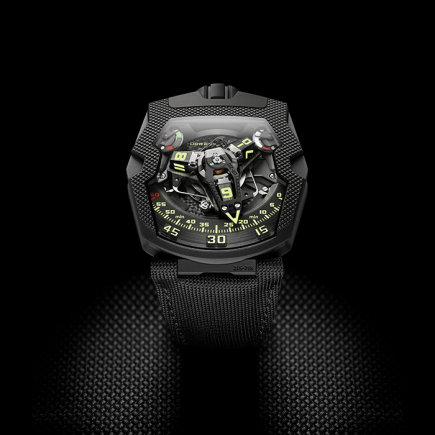 This new limited edition Urwerk watch model comes as a valuable addition to the previous Urwerk watches produced out of titanium only. The new Urwerk Maverick watch with a bronze case, satellite movement and 48 hours power reserve is actually more than a watch. 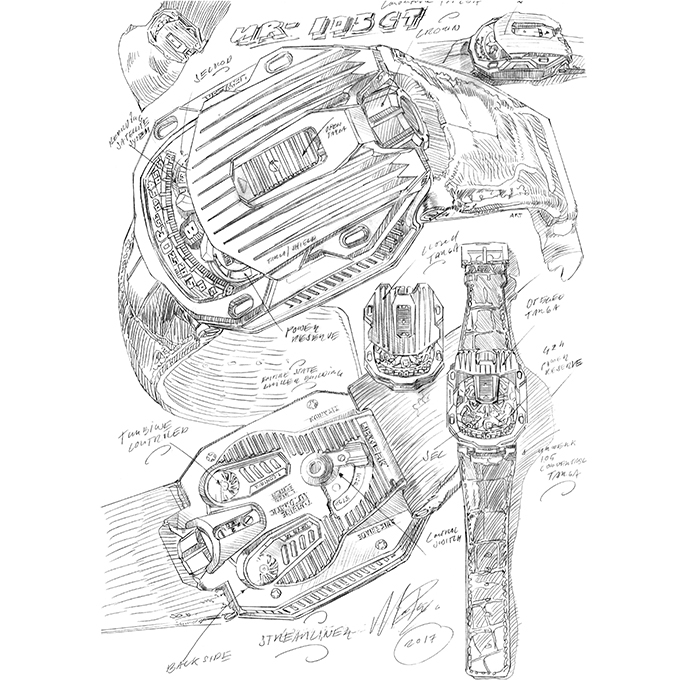 Unlike high-end watches from famous brands such as Audemars Piguet or Richard Mille, the limited edition Urwerk Maverick can be seen as a sculptural piece of art that tells time. Importantly, this new Urwerk watch with a bronze case stays true to the DNA of the Urwerk brand and all the emblematic properties of the movement are still found in this watch model. 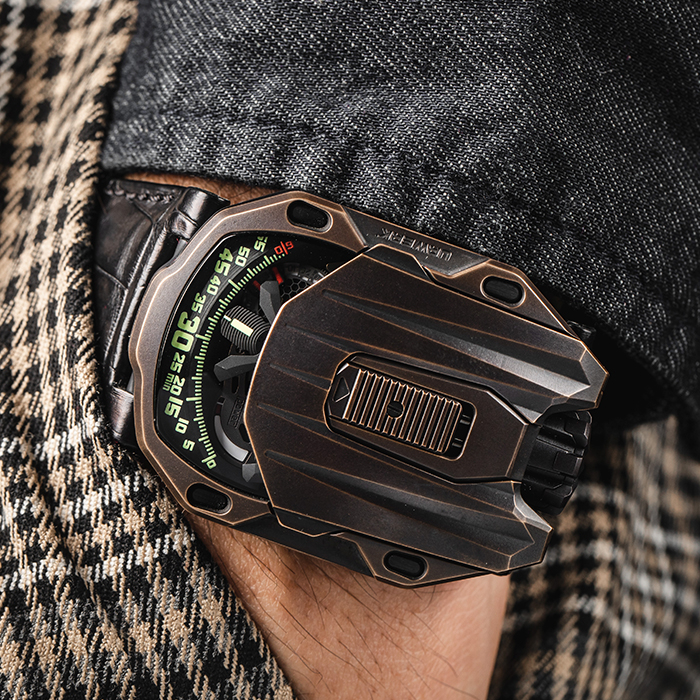 The black titanium used for the case of this Urwerk watch offers a particularly interesting contrast to the bronze used for the bezel protecting the watch case like an armour. Bronze is an alloy of copper and tin. In addition, bronze often contains other metals, including aluminium, manganese, nickel and zinc. 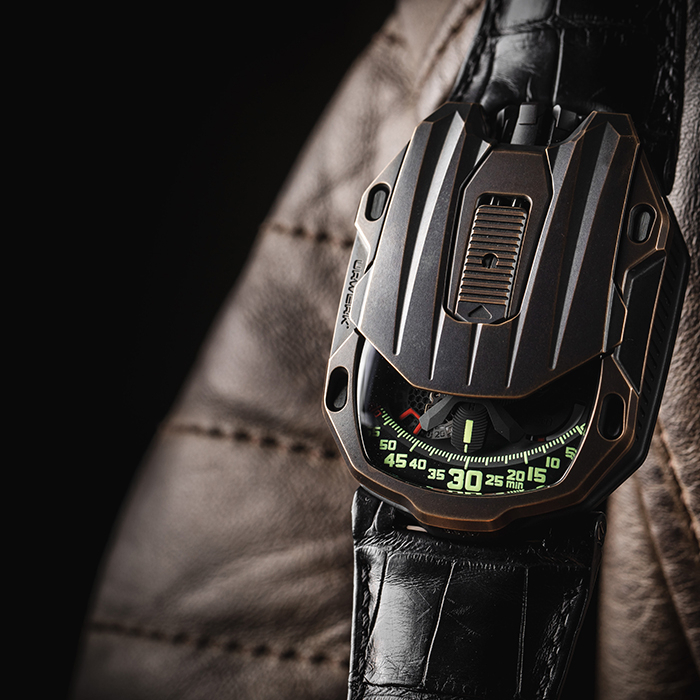 Typically, bronze watch cases appear almost yellow, however, the case of the Urwerk UR-105 CT Maverick watch exhibits a rich, dark tone. Unlike watches with a gold case, bronze watches (often produced in limited edition) have the particularity of evolving over time, accruing a unique patination based on the lifestyle of its wearer. The black dial of this 48-hour power reserve watch with satellite movement nicely reinforces the black titanium used for the case. Indeed, the bronze of the bezel is so visually powerful that the designers of this Urwerk watch needed to create a strong contrast for the hours and minutes display, which remain the main attraction of the watch. It was, therefore, a judicious choice to use vivid yellow-green numerals on a black background in order to augment eye-appeal and heighten legibility of the hours and minutes. Time is read extremely easily on a linear scale above which the satellite hours pass smoothly. 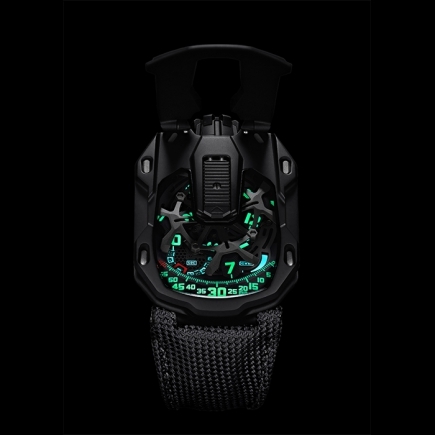 Urwerk watches have become famous and recognizable through their innovative movement mechanisms offering a new visual interpretation of the passage of time. 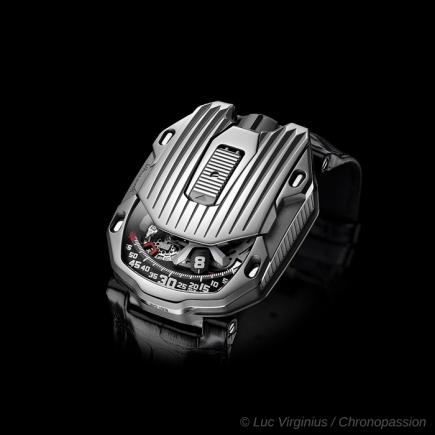 The Urwerk emblematic movement and the signature element of the brand for the past 18 years is a wandering hour indication based on a carousel, which carries the four satellites of the movement, each bearing three numerals for the hours. The hours successively sweep past the minute's scale for an analogue and digital display of time. An avant-garde and unique way of telling time for a different type of high-end watch lovers than those wearing big brands such as Audemars Piguet or Richard Mille. On the movement this limited edition Urwerk watch with 48 hours power reserve, one last interesting element deserves to be mentioned. Indeed, the movement also features a seconds indicator, which has been positioned on the left side of the black background minutes dial. The seconds are displayed on a rotating disk and the indication is highlighted by a bright red arch. Again, a stunning visual contrast to the black dial, the black titanium case and the yellow-green minute's indications. 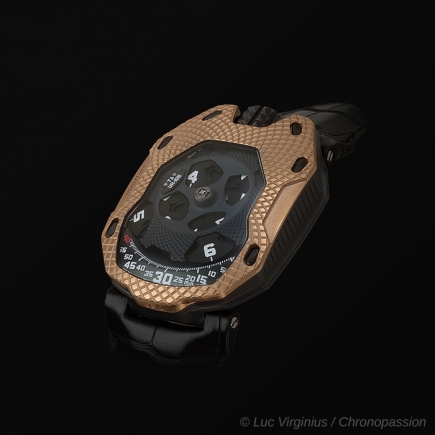 The limited edition Urwerk 105 ct Maverick in bronze features a self-winding mechanical movement with a power reserve of 48 hours and is water resistant to 30 meters. 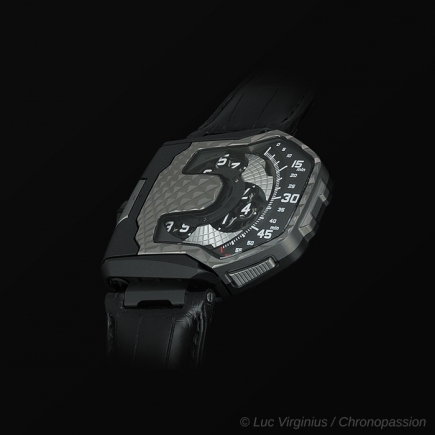 The self-winding mechanical movement is coupled to two air turbines for optimal regulation of the watch. 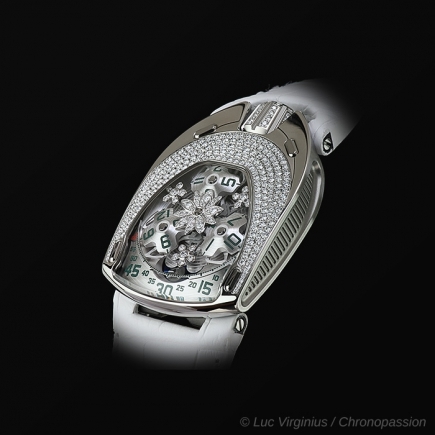 These turbines can be observed through the sapphire crystal on the back of the watch case. 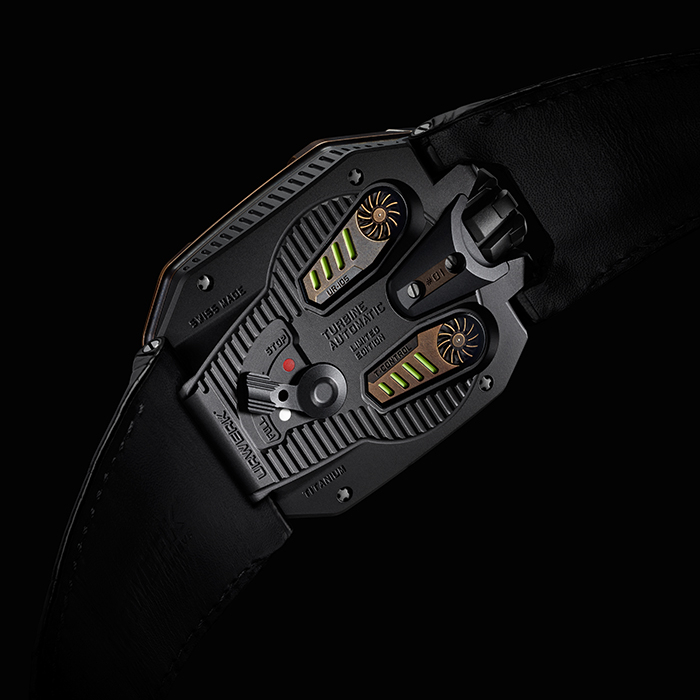 The turbine mechanism is an emblematic feature of the Urwerk watch movements. The Urwerk 105 ct Maverick with a bronze case and a 48 hours power reserve will speak to the educated, younger generation in quest of modern and futuristic mechanics. Not those whose interest revolves around the download of apps and lyrics on their smart watches. 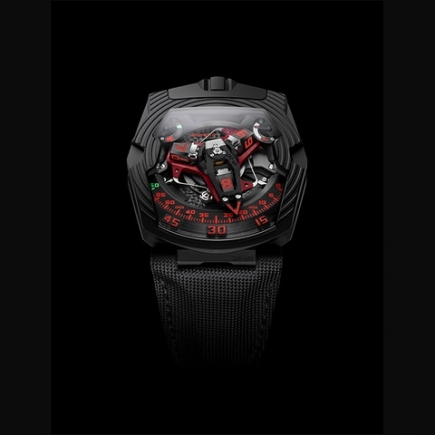 The limited edition Urwerk 105 ct Maverick watch is a piece of art offering futuristic time telling, a blend of materials (black titanium and bronze) and supreme movement finishing. A simply outstanding way of telling time thanks to a mechanical movement. Satellite hours turning on Geneva crosses in beryllium bronze; open-worked aluminium carousel; open-worked digital seconds; carousel and triple baseplates in ARCAP.